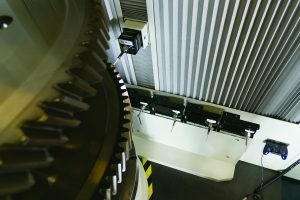 Developed for form grinding of gears, BURKA-KOSMOS and TYROLIT combine strengths to develop the new force in grinding technology, MIRA ICE, to help gear manufacturers significantly improve their processes. 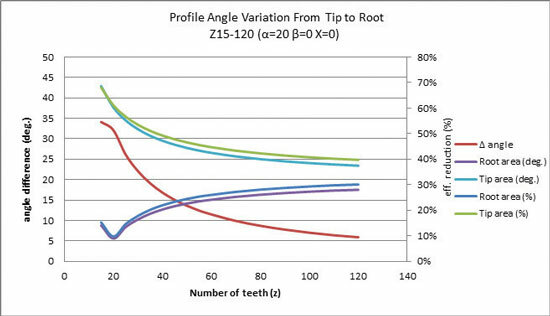 PeripGear tooth profile grinding has traditionally been thought of as a slow process. 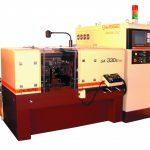 Initially developed as a discontinuous generating process, a coarse pitch workpiece grind cycle time was measured in days rather than hours, minutes, and seconds. 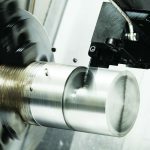 The development of discontinuous profile grinding allowed the complete left flank and right flank profiles to be finished at the same time and has significantly improved the cycle times of grinding. 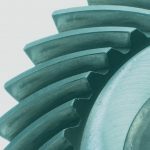 The machine technology is constantly advancing to provide gear manufacturers with the most efficient process possible. Conversely, the grinding tools are also continuously advancing to meet or exceed the requirements of the machines. 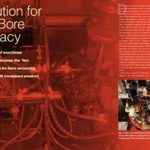 In recent years, there have been many advancements in abrasive technology, and the following paper describes how MIRA ICE has been developed by combining forces of BURKA-KOSMOS and TYROLIT to help gear manufacturers significantly improve their processes. 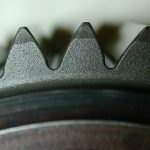 This product was developed for form grinding of gears, but we have also had recent success in applying this same technology to other gear hard finishing processes. For this paper we will focus on form grinding. In order to develop new technology it is important to understand the problems that are associated with current technology. Form grinding is typically used for grinding large diameter gears. The process is very flexible and is commonly found in job shops. 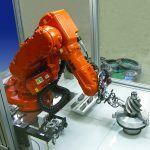 In this environment, small lot sizes and prototype parts with varying dimensions, modules, and pressure angles require this flexibility. 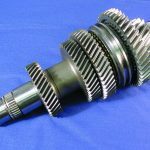 The end uses for these gears include, but are not limited to wind power generation, heavy industry, mining, steel, tractors, and bridges. 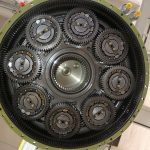 The intense working condition these gears must endure makes the grinding process control extremely critical. 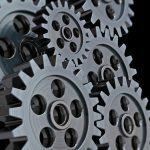 Material, heat treating, and quality all must work together to make the finished gear meet the level expected. 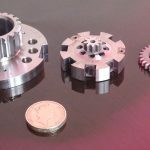 There are typically vast expenses and a long lead time to get the parts through these processes. If one part is scrapped it is a large loss for the company. Specifically, at the finish grinding stage it is extremely important the part meets all tolerances that is required and has no grinding burn. Additionally, this must be done in the shortest amount of time in order to be competitive in the marketplace. 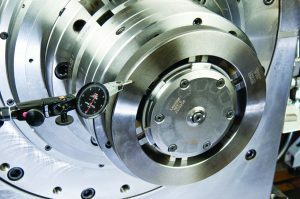 For this reason, BURKA-KOSMOS / TYROLIT has developed a new specification to be able to produce parts faster and more economically. This new technology allows for higher material removal rates and increased cutting volumes in a “COOL” condition, therefore minimizing risks of grinding burns. 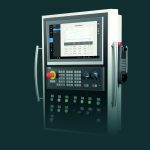 While maximum V’w can differ from one workpiece to another, it does provide a more consistent guideline once a baseline has been established. %%0515_Radia_4%% shows the evolution of vitrified grinding wheels and their respective performance levels with respect to V’w. If the volume exceeds the capability of the grinding wheel it can also be a cause for burning. 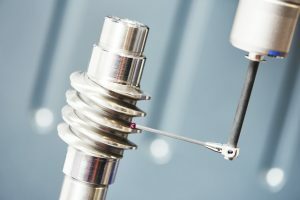 This paper will not go into detail but there are many other factors that can cause parts to burn during profile grinding such as improper coolant application, dressing parameters set up too fine, inconsistent workpiece material, inconsistent size of parts, inconsistent heat treatment, and improper stock dividing to name a few. This covers just a few of the important items that all work together to form the process. 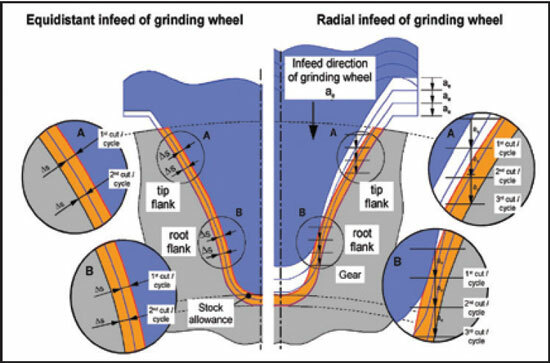 If everything can be held stable it should remain consistent, but the reality is there are always variations that can have a major influence on the performance of a grinding wheel. Previously, to maintain production it was necessary to have a series of different specifications to deal with these variations but new technology is changing this. 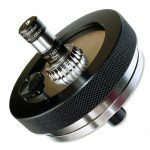 Wheels now cover a wider spectrum of components and eliminate the need for so many different specifications of grinding wheels. MIRA ICE uses a specific engineered grain combined with a high strength bonding system to guarantee cool grinding at increased material removal rates (%%0515_Radia_5%%). It is this interaction between the grain and the bond which allows MIRA ICE to significantly reduce total costs per unit produced. The bonding, while it does not actually remove material, is just as important, if not more important than the grain to the grinding process. The purpose of the bonding is to hold the grains in position to grind. It should be strong enough to hold the grain until it wears enough that process pressure creates micro-fracturing to keep the grains sharp for grinding. MIRA ICE with the specific engineered grain and special bonding creates a more porous wheel that allows coolant to penetrate and chips to be removed. 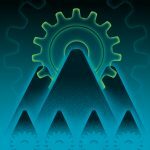 The statements above show only a few points to help understand the complexity of form grinding of gears. The variables change drastically from one part to another with very few constants. This makes it difficult to really optimize a grinding process and is why there are so many machines that are not producing parts to their full potential. 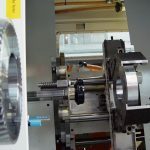 We try to simplify this by using a combination of calculations to define the process prior to putting grinding wheels or parts on the machine. We can then quantify the potential cost savings and process improvements to confirm testing is beneficial. We look at each step of the complete process to determine where we can make the most impact and start evaluating this more closely. Normally, the largest portion of a form grinding cycle is the rough grinding. With all of this information collected we can have defined parameters and expected lifetimes for both high production and job shop type environments with small lot sizes. 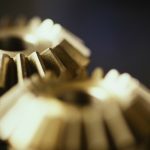 In the first case we ground a 7.4 Module 69 tooth helical gear. The objective of this test was to decrease the cycle time and also try to increase the total amount of parts per grinding wheel. In this case MIRA ICE was used to decrease the cycle time by 31 percent from 80 minutes to 55 minutes. Furthermore, we were able to increase the amount of parts per grinding wheel by 85 percent from 35 to 65 parts. This translated into a 25 percent capacity increase and a savings of more than $16,000 for 500 parts annually. In the second case we ground a coarse 12.7 module helical gear. The objective of this was also to decrease the cycle time. MIRA ICE was used to decrease the cycle time by 40 percent from 286 minutes to 172 minutes. The wheel life was also optimized and able to increase from 7 to 17 parts per wheel. 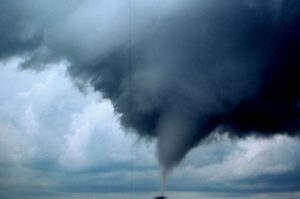 The cycle time was reduced 40 percent from 286 minutes to 172 minutes. This provided a 42 percent increase in capacity and a total savings of $163,000 for 1,000 parts annually. In the third case we ground a 7.4 module internal ring gear. The main objective of the end user was to increase the amount of parts produced per grinding wheel. 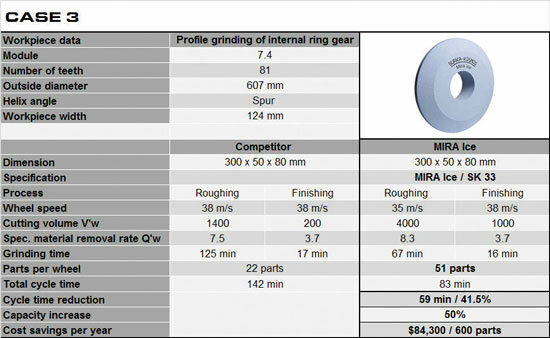 By increasing the cutting volume from 1400 to 4000mm3 during roughing and from 200 to 1000mm3 during finishing MIRA ICE was able to help increase the number of parts from 22 to 50 parts per grinding wheel. Through this process the cycle time was also reduced more than 41 percent from 142 minutes to 83 minutes. This translated into a 50 percent capacity increase and a total savings of $84,300 for 600 parts annually. 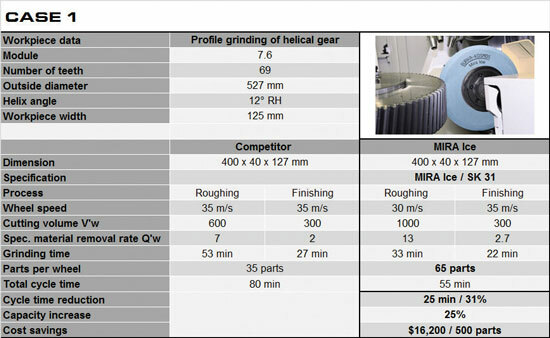 In conclusion, the latest MIRA ICE specifications are capable of important process improvements that can provide tremendous savings for gear producers. It is more flexible than previous specifications and should help you eliminate the need for many different specifications to meet your needs. Lastly, the wheel is designed to run “COOL” so there is a low risk of burning, which can be extremely expensive on larger gears. If you are looking for process optimization and cost savings please consider using advanced technology vitrified abrasives. 1. 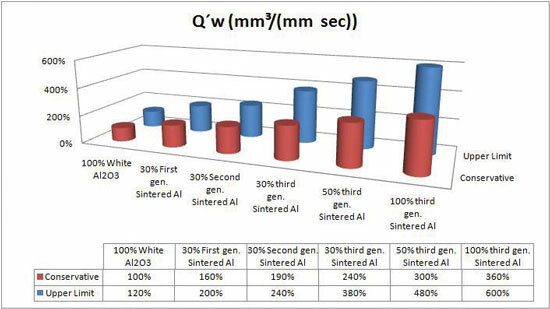 Christoph Gorgels, Heiko Schlattmeier, and Fritz Klocke “Optimization of the Gear Profile Grinding Process Utilizing an Analogy Process,” Gear Technology, November / December 2006, pp. 34-41.
is the business unit manager — gear for Radiac Abrasives. 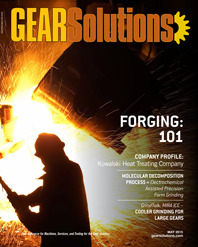 is application engineer — gear for Radiac Abrasives. 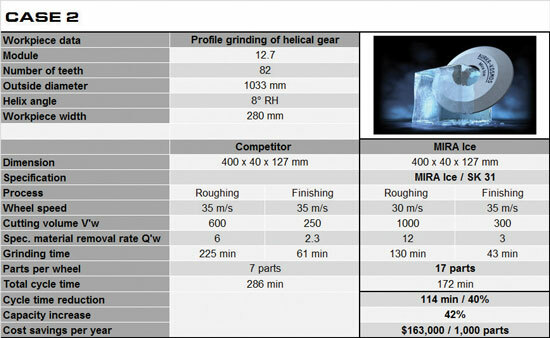 For more information on MIRA ICE please visit radiac.com or send an email to gear@radiac.com. is an application engineer for Burka – Kosmo.